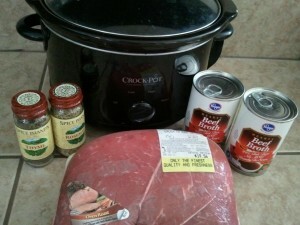 Slow Cooker Mondays: French dip sandwiches! 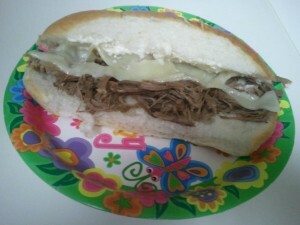 You are here: Home / recipes / Slow Cooker Monday / Slow Cooker Mondays: French dip sandwiches! Who wants to cook on Mondays? Not me! It’s hard enough to get everything together on a Monday morning to get out the door for work and by the time I get home, I’m usually worn out. 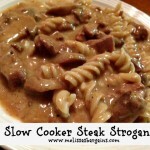 I love my slow cooker and our family would be eating out all the time probably without it! 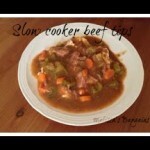 I’m going to start sharing a favorite slow cooker recipe with you each Monday. I hope that you’ll enjoy! My time is limited in the mornings, so most of these recipes can be quickly thrown together (literally!) in a few minutes! Today’s recipe is a family favorite – french dip sandwiches. It doesn’t get much easier than this. The only “work” involved for you is shredding the meat when you get home. They are sooo yummy! Place roast in a greased slow cooker. Pour broth over the top of the roast. Add spices. Cover and cook on low heat 8-10 hours (or high heat 5-7 hours). Remove roast and save extra juice. With a fork, break the meat apart and serve on hoagies. Use excess juice for dipping sandwiches. Here’s the finished product. Sorry we didn’t have any “fancy” plates to make it look pretty. We were celebrating my niece’s birthday and she thought they were plenty fancy! We served these with fruit salad and veggies and dip! 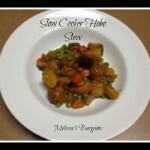 If you have a favorite slow cooker recipe to share, please e-mail me or submit it in the comments! 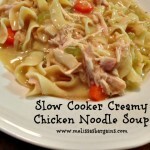 Slow Cooker Mondays: Creamy chicken noodle soup! Meg – when I made it this week, I was feeding 12 people, so the roast was pretty big (I can’t remember how big off the top of my head). I would try it with the broth instead of the soy sauce/bouillon. I’ve never had a problem with it being dried out! 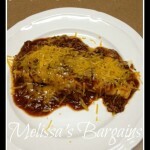 I used my regular recipe just put it on low and cooked it way less than the recipe said to and it was perfect! So apparently, my Crock Pot only needs 6 hours to do a 3 lb. roast. My recipe says it serves 12, but I guess the 4 of us are big eaters because there weren’t too many leftover. Meg – so glad it worked out for you! I always cook a big roast because my family loves french dip leftovers! Plus, I use some of the meat and turn it into a casserole. Maryanne – I’m not a fan of onions, so I can’t do the onion soup. LOL! Got to try it. I know my son will love it. 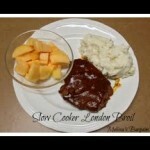 I’m making this for supper tonight for my husband’s birthday! It’s one of our favorites, but I don’t make it very often. I’m using beef stew meat instead of a roast. Looking forward to dinner tonight! just wanted to tell a trick to help break down the proteins in the beef and make it easier to break apart. Depending on how much beef being made, used between 1/2 cup and 1 cup of either Apple cider vinegar or regular vinegar. This will help when trying to shred the beef and it makes it easier and not as tough. There is no vinegary taste but it does make the whole meal tastier. My brother does this all the time and he never has any left. Thanks for the tip Sibrina!